No drugs - No Side Effects! The ReBuilder® is a very specialized form of TENS (transcutaneous electrical nerve stimulator) that can produce dramatic improvement in the reduction of painful symptoms. The pain of peripheral neuropathy can be caused by many things such as poor blood flow, prescription medicines such as statins, trauma, environmental toxins, diabetes, chemotherapy, muscle spasms and many other things. No matter what the cause, the ReBuilder® is able to reduce or eliminate your pain symptoms. Like a pacemaker for your heart, the ReBuilder® electronically measures the condition of your peripheral nerves and corrects the problem. It is a 30-minute home based, self-administered treatment with no side effects. The ReBuilder® is a therapeutic treatment, not just a temporary pain-relieving device. The results are cumulative. Walk Pain Free with Better Balance. Sleep Better with Less Pain & Restlessness. Reduce or Eliminate Pain Medications. Save Money by Reducing Prescription Pain Meds. No side effects like fuzzy thinking, tiredness, and memory loss. FDA fully Registered as a TENS and EMS class II medical device. There are many and all kinds of nerve stimulators on the market, but the ReBuilder® is the only device that duplicates the exact waveform and frequency of a healthy peripheral nerve signal. It doesn't matter if you're diabetic or not, whether you're chemotherapy induced or idiopathic, the ReBuilder® alleviates pain, burning, tingling, and numbness. The ReBuilder® is easy to use, involves two 30-minute treatments per day, and has no side effects. The ReBuilder® is an "intelligent" medical device. It has three parallel processors that analyzes the condition of your nerves 7.83 times per second, and then computes and delivers the corrective signal, specific for you. As you change and improve, the ReBuilder® changes with you. Everything is automatic and simple, just turn it on, sit back and relax. Help to eliminate the painful symptoms of peripheral neuropathy. Help to re-educate, strengthen, and increase muscle mass while reducing the pain from Chronic Demyelinating Polyneuropathy (CIDP) and Guillain Barre Syndrome (GBS). Help to reduce the painful discomfort of Reynaud's disease. Treats the painful symptoms of diabetic peripheral neuropathy, chemotherapy induced neuropathy, and idiopathic neuropathy. The ReBuilder® delivers an electronic signal that travels from one foot, up that leg via the sciatic nerve, across your lower spine, and down the other leg to the other foot. This soothing signal helps improve the communication between your nerves and your brain, resulting in the reduction, and often the elimination, of the pain you are experiencing. It can also be used to treat issues in the hands in a similar fashion. The muscle stimulating part of your ReBuilder® strengthens weak muscles and increases local blood flow. The ReBuilder® is an electronic device used in the privacy of your own home. Sleeping all through the night. Feeling the carpet under your feet. Striding tall, with a firm, confident gait. Saving money by reducing prescription pain meds. 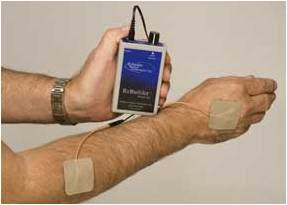 Relaxation of muscle spasms, prevention or retardation of disuse atrophy, increasing local circulation, muscle re-education, immediate post surgical stimulation of calf muscles to prevent venous thrombosis, maintaining or increasing range of motion, symptomatic relief of chronic intractable pain, post traumatic and post surgical pain. The ReBuilder® is a small, hand-held, battery powered nerve stimulator that sends a comfortable electronic impulse to your feet and legs. The ReBuilder® is effective for hands, knees, elbows, back, feet, and legs. The ReBuilder® is effective for any type of pain: neuropathy, carpel tunnel syndrome, sciatica, low back pain, CIDP, post polio syndrome, PAD, PVD, MS, MD, arthritis, etc. The ReBuilder® itself comes with self-adhesive and conductive carbon rubber electrodes, but there are other ways to administer the ReBuilder® signals using accessories like conductive socks or gloves, footbath system. You can see this products offered at our “by products" section. Self-adhesive electrodes directly are applied directly to the skin, one on each foot, or one on each hand. Conductive socks can be used for better treatment of the toes. They can be used dry, or for an even greater level of stimulation, they can be used with electrolyte conductivity enhancer to signal delivery. 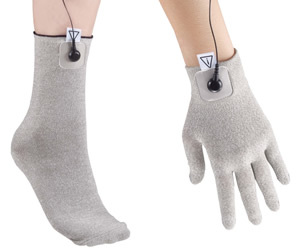 To use, you simply put them on, snap the ends of the lead wires to the socks, and turn on the ReBuilder®.